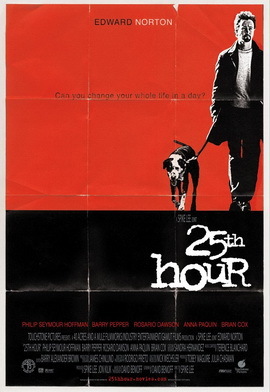 25th Hour is a neo-noir from a not so likely source, Spike Lee. This takes place in New York, so Lee isn’t a bad choice. Lee has actually been making some great neo-noir and crime films before and since this. I really liked Son of Sam, Inside Man and though it isn’t as good as the original, I thought Oldboy was pretty good. This film revolves around Monty, played by Edward Norton. Norton is one of my favorite actors in today’s films. He usually picks pretty strong scripts and always does a great job. Monty is going to jail tomorrow and is going out with his friends for one last night of freedom. Monty is a drug dealer that gets busted and doesn’t know who ratted him out. His girlfriend is played by Rosario Dawson, is she our femme fatale? She is another actress I’ve liked in most of the things she has done. Barry Pepper plays the sleazy stock broker that thinks he’s better than everybody else. He plays the part well. Our hero’s other friend is played by the late great Philip Seymour Hoffman who plays a shy teacher with a bit of a dark side. Other standouts in the cast are Brian Cox as Monty’s father and Anna Paquin as a high school student. We also see Isiah Whitlock Jr. as the DEA agent and swearing like only he can. The film is based on a book by David Benioff who also wrote the screenplay, his first. He has gone on to do many more screenplay adoptions for movies and television. We have a lot of great stuff in this film and one of the things I forgot about was this being made in New York City in 2002, the loss of the Trade Centers is an import part of the back drop. The movie opens with Monty and one of his mafia friends picking up an abandon dog, left on the street to die. Monty takes the dog in as his own. I guess this is to show our hero is a good guy at heart and a drug dealer by necessity.We flash forward to Monty’s last day of freedom and we have the occasional flash back to explain how we got to this point. Monty needs to make a decision, go to jail for 6 years, run, or suicide, all of which, him and his friends consider on this final night. Favorite tidbit: Edward Norton says he believed in this project so much that he used all his earnings from Red Dragon to help make it. This seems to fit Norton, do a few big films so he can do many small films he believes in. I always look forward to anything with him in it, and this might not even be in his top 10 films, but it is a good film worth seeing. A must watch for Norton, Dawson, Hoffman or Spike Lee fans, as well as neo-noir fans. It’s a film that will make you think and stay with you awhile after you see it. What would you do in this situation? Your review made me want to watch this film. I wonder if I can find it at Family Video? I love all things Ed Norton! Thanks for the great review. I will follow you for more!